The first electronic television was introduced to the world 90 years ago. Right off the bat, everyone knew it was love at first sight. Fast forward to the present day, and video content is projected to account for more than 80 percent of the world’s internet traffic. 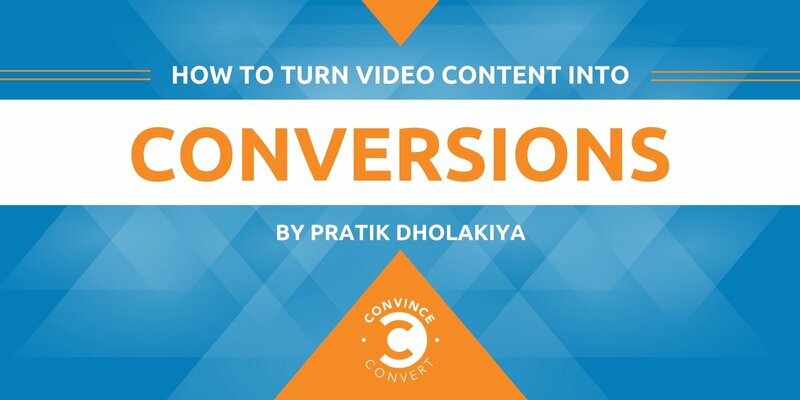 That being said, it seems like every brand on the market is pulling out the stops to invest in video content as a prime vehicle for conversions. However, standing out in the crowd requires a great deal of planning. Let’s talk about how you can turn your branded videos into a cornerstone of your entire promotional strategy. Nearly every aspect of business success, and the ability to convert customers, comes down to one common denominator: knowing the audience. Conducting business is a constant game of meeting popular demand. First and foremost, you should always critically evaluate why exactly you are producing a video and what you want to achieve with it. Once there are clear-cut goals in mind, you need to gauge your audience down to the granular details. At the end of the day, conversions occur when you put the right content in front of the right eyes. For inspiration, start by getting a feel for the trending topics across the web. Using content monitoring tools like BuzzSumo, you can search brand names, industries, or specific keywords and find out the most popular and relevant topics for your industry in real-time. Using these insights, you will have a good idea of what issues to craft your videos around, and which channels would be most optimal for distribution. Keep in mind that monitoring tools are only the tip of the iceberg. For instance, if you are in retail, there is a whole new dimension of preparation you need to consider when creating video content. The last thing you want is to release your branded content with a disorganized inventory. You need to know exactly what your demand scope is prior to distribution. In these cases, predictive analytics are a necessity. If you have the crucial ecommerce numbers, such as historical sales rank, pricing data, and order volume, you can combine them with the trending issues you found through web monitoring, learn what kind of topics to address in the near-term, build promotional content in the appropriate form, and prepare your inventory accordingly. In recent decades, it seems as though the very definition of promotion has changed. For example, it’s becoming painfully obvious that traditional forms of marketing are no longer as effective as they once were. Today’s audiences (especially millennials) do not like seeing intrusive ads with deals or coupons. They want brands to be authentic in a way they can relate to. Keeping this in mind, powerful video content these days is not blatantly focused on selling, but rather on educating. All too often, brands commit the deadly sin of creating content for themselves, not the viewer. Missing the mark in any area in the buyer’s cycle will almost always lead to disconnect further down the road. In many cases, the most important piece of the puzzle is creating a high level of trust between brands and consumers. To do this properly, you need to place a priority on solidifying your status as an industry expert. Producing educational content in the early stages of the cycle is a must. Depending on the nature of your business, consider creating how-to videos or webinars for this area. ClickMeeting is a video conferencing tool for preparing and hosting these types of sessions. With interactive “webinar rooms” designed for the everyday user, you’re able to answer questions and share educational content in a matter of clicks. 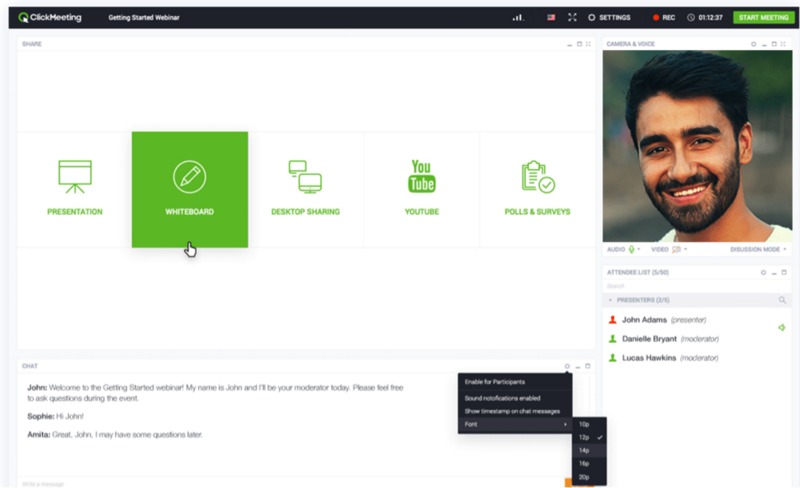 Regardless of your campaign goals, ClickMeeting is extremely useful in nurturing leads and guiding users through the sales funnel, as you can send out customized invitations and conduct interactive meetings or seminars targeted at customers along each stage of the funnel. With insights gleaned from intuitive engagement analytics, you can build lifetime relationships with your audience. Once you achieve success in educating your prospects and showcasing authority in your field, the sales will begin to roll in. One of the common observations attached to the rise of the internet is that attention spans are notoriously short these days. People don’t typically want to sift through extensive content to get what they need. They want instant gratification. For proof of this phenomenon, look at the success of Snapchat, Instagram, and other popular outlets for social video. For the sake of conversions, it’s good practice to get straight to the point. Wistia, an online video hosting solution, includes a turnstile feature where lead capture forms are embedded within the content. 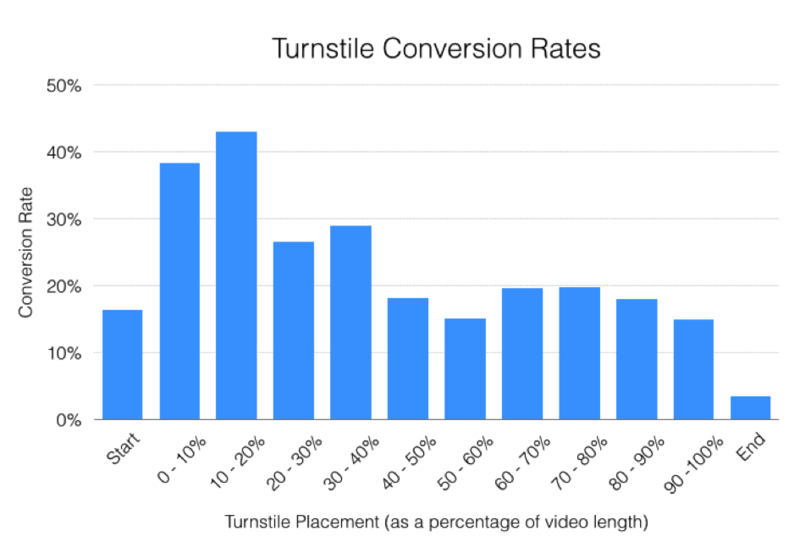 They conducted a study of over 15,000 videos with turnstiles and found that the highest conversion rates occurred in the first 10 to 20 percent of the video’s duration. Nowadays, you must keep in mind that many viewers consume content on mobile devices. In fact, it’s been a full three years since mobile became the primary browsing channel over the desktop. With this knowledge, you need to do your best to create compelling content with only the most essential information. Upon completion, take a close look and decide if the message can be properly deciphered with a mobile, on-the-go mentality. If you want to drive conversions, you need to captivate the audience with your messaging right out of the gate. Anyone can make a video, but producing ones that drive significant action can be quite a challenge. The key is to create videos that speak to every aspect of the sales funnel and provide value that people cannot get anywhere else. Once you solidify a reputation for authentic content that genuinely improves lives, conversions will be inevitable.